I really like steak and always manage to cook it right but I haven't got it down to a fine art. 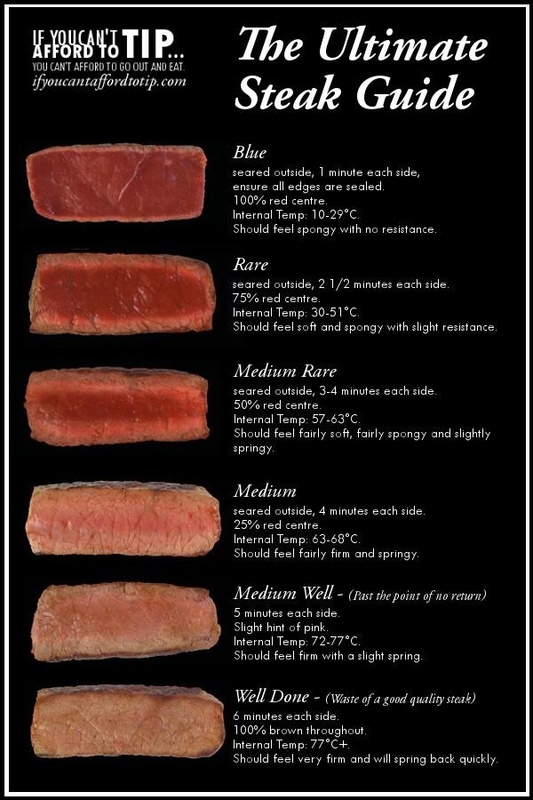 I like my steak medium rare and though I always manage to get it very pink in the middle I don't know the exact times. How long should I cook a steak, and at what temperature, to make it medium rare? Thanks. This is a 'how long is a piece of string' question. The thickness of the meat, the thickness and material of the pan, your hob type and various other factors will all influence the cooking time. So it is impossible to give you a hard and fast answer. The best solution is to simply remove time from the equation altogether. Invest in a quick read digital probe thermometer and measure the temperature! You want the steak to be 55-57C in the middle for medium rare. It will keep cooking while it rests, so take the steak off the heat when it hits about 53-54. Don't time your steaks. A medium rare steak will feel like the pad of your chin when pressed. Press your finger against the fatty pad at the end of your chin, then (after cleaning your hands, sanitation first! ), press against the middle of the steak. They should feel about the same. Not the answer you're looking for? Browse other questions tagged temperature cooking-time grilling steak or ask your own question.